Israel said it regretted the incident - but added that civilians had been warned to flee the village. I continue to ask myself how many more innocent people have to die before the Americans, the British and other leading players in the international community denounce these heinous crimes against humanity? 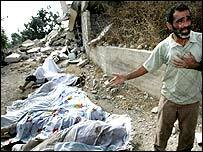 At least 34 children are dead while the Israelis hardly bat an eyelid. What the Israelis are doing is downright disturbing. Yes Israel has suffered greatly too but that does not give them the right to kill innocents at will. Their actions make them no better than the people they oppose. Amidst the death of men, women and children in Lebanon, we have also witnessed the sad demise of Israeli morality which has succumbed to bloody, mindless butchery. Viewing this situation one can't help but draw parallels between Israel's actions and that of Shakespeare's Macbeth, the latter of course who began his slow descent into evil thanks to his barbarous, murderous deeds. In a similar fashion the Israelis are 'stepp'd in so far' that to pull back now would show the world how futile their actions were to begin with. No, instead, much like Macbeth, they will continue to wade in the blood of innocents while also taking the silence of the key players in the international community as a green light for more acts of gargantuan carnage. Is there anyone virtuous enough in the international community to stand up, heroically, to the Israeli tyrant?